If you've ever seen Dippin' Dot's marketing (in real life), it's all about how this is how we will eat ice cream in the future. It's seriously just a matter of time. Perhaps they are right. 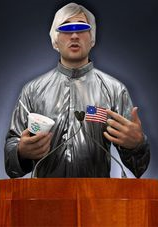 So the Onion explored it, where a traveler comes from the distant future, and while he recognizes a few differences, he is most struck by our barbaric means of consuming ice cream. Here is a passage: "and I began to weep, for I realized that I am a stranger in a strange land where Dippin' Dots are not a popular and universally beloved dessert.". Anyway, my POINT is that he's wearing a visor. This picture of Dippin Dot Adventurer From The Future. And maybe we all will, some day. Some of us do now. Imagine a visor that you could put on, which just "zooms in" a bit, in crystal clarity. Somehow just naturally focuses you a bit more narrow, but in a directed way. I'm not sure if it would be for everybody, but I bet many people would want it. Consider such a visor for a moment. Now, I wear glasses. If you're keen to have a piece of metal and glass as your constant companion, these are optimal, as far as I'm concerned. It's just a minimalist gold frame and glass. To a great extent, glasses ARE such a special visor -- blocking out things outside the lens and attenuating (gathering your attention) inside of the lens. But it's not all good news; about 30% of my vision is outside the lens. It is relegated to Blurryland. But not all is lost, since I never look there anyway, and still have full peripheral vision for light and movement (which is all you need that information for anyway). So I'm starting to wonder if that might not have its advantages. I wonder if, cognitively, my brain is able to attenuate a bit better to the focused middle portion -- like if literally more brain synapses are attenuated to that input rather than the outer. And as a result, it has like a focus-attention-enhancement effect. Obviously, you have worn glasses once or twice, if only sunglasses. You might wear glasses all the time. But unless you're wearing them right now, you might forget what it is like, because your brain generally focuses out such details. 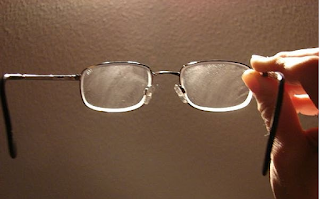 So, I tried to find a picture online of what it feels like to wear glasses. There are tons and tons of pictures, but I knew precisely what I had in mind, and couldn't find it. Finally, it drew it (first in Visio, then refined in Paint). This is kind of what it's like. So that's it. That's what it's like to wear glasses. Every now and then they will ride down your nose. You have to keep them with you at all times. I search for them occasionally -- more often than I'd like to admit. You should keep them clean. There's a new way that you improve your vision, called Visian ICL. It involves putting a lens behind your eye that gives you instantly flawless vision. Unlike LASIK, it involves virtually zero material impact to the eye itself. This is a link to a marketing video about the procedure. I think this sounds amazing. I am seriously considering this, to hell with my financial future. This may be worth it. I heard a rumor that you can get the lenses POLARIZED. OMG, it would literally take the glare off of everything you ever see in bright light. I'd be 20% towards being RoboCop. Are Glasses A Form of Targeted Reticle? So let's explore the earlier question a bit more: Could glasses actually help someone focus better? And here, I don't mean in the sense of focusing a lens, but in the sense of focusing your attention -- better known as concentrating? I've read that blind people have far great attenuation of their other senses. They hear better, touch ridiculously better - even without knowing braille, and if they do, even better. On some cosmic level, this is a re-routing of neural activity -- kind of the brain paying attention. I'm not saying that this improved attenuation 100% makes up for the lost sight input, but it's certainly there. Maybe that phenomenon is happening with my glasses. And the net result is that, if I were to get this procedure, that I'd "see" much better, but would have a marginally harder time focusing upon what is right in front of me, because I get distracted more easily from details in the periphery, that are now more easily shut out. I bet a formal study would conclude that I do indeed have a 3.2% higher input attenuation while wearing my glasses. ...But it would no doubt also observe an average -7% reduction, because I don't clean my damn glasses nearly often enough. I know, I know. I keep meaning to clean them. Since polarized lenses change the colors of everything, a person viewing life through polarized lense implants will be color-impacted to some degree. Has there ever been any research on whether "looking at life through rose-colored glasses" might very well be a cure for depression?